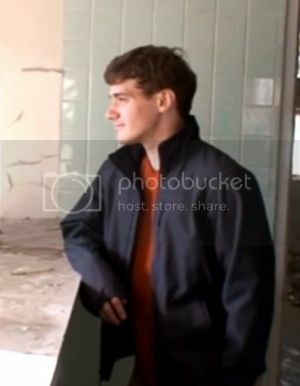 Brian was the lead actor in Marble Hornets, and a friend of both Alex Kralie and Tim. His character in the film was a college student, who comes back to his hometown to mend his relationship with Sarah and Tim, his old high school friends. Brian, like most of the Marble Hornet's crew plays a character of the same name. Brian first appears in Entry 7. Brian is an easy going guy, but remains cautious. He doesn't like to break rules, and is a bit of a joker. In Jay's interview with Tim in Entry 15, we learned that Brian lived near Alex and was the one who introduced Alex and Tim to each other. That interview also revealed that, like Alex, Brian has not been seen in some time. Tim also says that he was close friends with Brian and that he didn't know Alex before the shoot. After seeing Advocate, Jay decided he needed to find Brian, and received an anonymous tip that he could find him at the house. In Entry 16 he goes to the house. Brian was never seen there, though later entries heavily supported the identification of the house as being Brian's. In Entry 17 Jay feeds Tim Brian's lines, Brian is said to be getting snacks at the time. In Entry 18 Jay returns to the house that is said to be Brian's. In Entry 86 Alex shows Tim the dead body of Brian dressed as the hooded man. It is mentioned that Brian is Tim's first real friend. There has been some speculation that Brian may have been working with Tim to create the totheark youtube account. That even Tim could have killed Brian. But this is a rather unpopular theory as the evidence is very circumstantial, only that Brian appears in the Advocate Video and the bullet casing found in his home. Could the blood seen in The House be Brian's? Due to the gun shell found in The House, and Alex's gun seen in Entry 52, could Alex have he killed Brian?